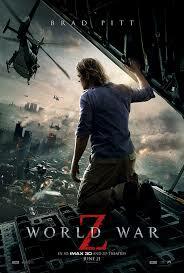 World War Z is a 2013 apocalyptic action horror film directed by Marc Forster. The movie is based on the 2006 novel of the same name by Max Brooks. The film stars Brad Pitt as Gerry Lane, a retired U.N. employee who must travel the world to find a way to stop the Zombie pandemic that is toppling armies and governments, and threatening to destroy humanity itself. This movie is classified as action, drama, horror and has truly fulfilled the three genre. Suspense at the right moments, making you hang on tight to the side of your chair. We give it a rating of 7. Worth the watch if you’re a into suspense and horror. Watch and then let us know what your thoughts on the movie. This entry was posted in Entertaintment and tagged action, drama, horror, movie, review, suspense, zombie by Miss P. Bookmark the permalink.